I was looking for a change of pace. I honestly didn’t know anything about it except that it was free on Kindle and thought, why not? About year after a disease infecting everyone sixteen and older, we meet up with a group of kids living in a supermarket. Those that weren’t killed from the disease turned into ‘zombies’. The kids are beginning to run out of options when a mysterious traveler arrives and offers them safe haven at Buckingham Palace. I don’t want to give too much away but of course the journey across London is not easy. 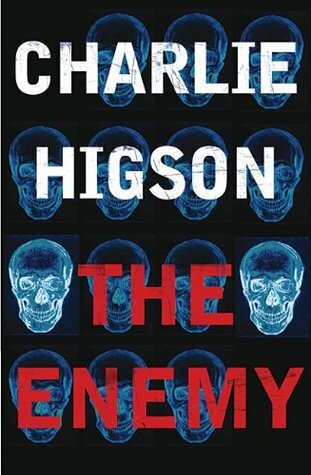 The Enemy is marketed as a white-knuckle tale of survival. I’ve read other reviews that say this is the most brutal or goriest dystopia novels. Eh. The Furnace series by Alexander Gordon Smith or the Quarantine series by Lex Thomas are much more brutal and possibly better series. I was never scared and I’m a big baby. There are so many characters that when one dies, eh. The real saving grace of the novel was the little kid, “Sam the Giant Slayer,” now that’s a kid I could read a whole book about. Otherwise, I felt no connection to anyone and so I really wasn’t sad or upset or whatever. I just read on to the next fight scene. I didn’t hate it but I also didn’t love it either. I might be a little bit more passionate if I paid for the book. I guess I expected more from a book that is supposed to start a seven book series. This entry was posted in Post Apocalyptic, Young Adult, Zombie and tagged Charlie Higson, dystopian future, post apocalyptic, The Enemy, Young Adult, Zombie. Bookmark the permalink.